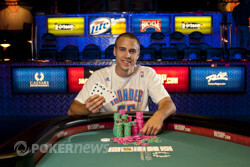 Austin Scott Wins Event 26: $3,000 Pot-Limit Omaha ($361,797)! 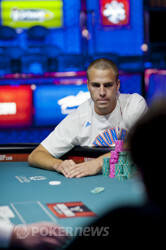 Last year, Austin Scott took eighth place in this event for $40,748. Not only did he better that performance this year, but Scott went on to win it all to grab his first-ever World Series of Poker gold bracelet and $361,797 in prize money. When the day began, Vadzim Kursevich held the chip lead on the rest of the field. He stayed in front for nearly the entire day, but then the big clash came with Scott when action was four-handed at the final table. Scott and Kursevich got all the money in on the board of in a massive pot of 3.7 million in chips. Kursevich held the for a set of nines and Scott the for top set of tens. The river completed the board with the and Scott exploded to a massive chip lead. When Scott got heads up with Brett Richey, he was a little over four to one in front. Richey did what he could to battle back, but in the end Scott was just too much. On the final hand, Richey was all in on the turn with the on the board. His two pair was up against the for Scott. When the landed on the river, Scott made a straight and won the tournament. 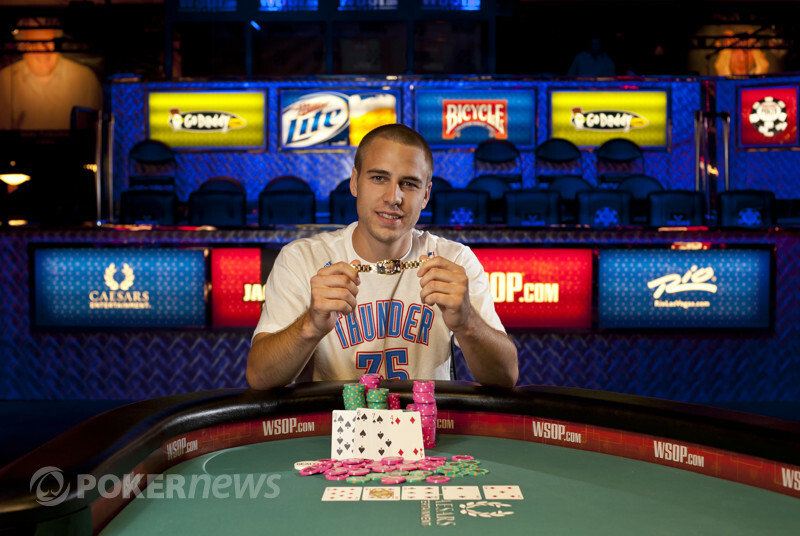 That wraps up [i]PokerNews'[/] coverage of Event 26 from the 2012 WSOP. Be sure to stay with us all summer long for our ongoing coverage and thanks for following along once again. Until next time, goodnight from Las Vegas! 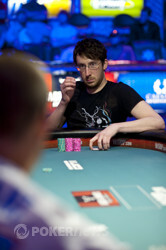 Austin Scott captures a bracelet in Event 26. He beats Brett Richey heads up for the title. From the button, Brett Richey made it 100,000 to go. Austin Scott called and the flop came down . Both players checked and the turn was the . Scott led for 125,000 and Richey raised the pot to 575,000. Scott moved all in and Richey called. Richey was all in for 840,000 with the for two. Scott held the for a hand full of straight and flush draws. The river completed the board with the and smacked Scott with a straight to the eight. He won the pot and eliminated Richey in second place. For his finish, Richey earned the largest score of his career worth $223,492. Austin Scott raised on the button to 100,000. Brett Richey called and the flop came down . Both players checked to see the land on the turn. Richey checked and then folded to a bet of 75,000 from Scott. Austin Scott raised to 100,000 from the button and Brett Richey reraised to 300,000 out of the big blind. Scott called and that brought the two players to the flop. Richey checked and Scott bet 150,000. Richey called. The turn was the and Richey checked. Scott fired again for 325,000 and Richey folded. The buy-ins for several major PokerStars tournaments are being cut in half on Sunday, June 17 for Half Price Sunday, including the most affordable Sunday Million that PokerStars has ever run. The huge prize pool guarantees stay fixed, so you get to play for a share of millions in cash prizes for less than ever before! Prizes: 10 Bonus Half Price Sunday Million tickets (for June 17 only) will be awarded to the top 10 finishers on top of the cash payout. All players are eligible who pay the buy-in fee and register with the password, which will be distributed in PokerNews editorials and the live reporting pages. Brett Richey made it 100,000 to go from the button and Austin Scott reraised to 250,000 from the big blind. Richey called. The flop came down and Scott fired 175,000. Richey folded and Scott won the pot. Brett Richey limped in from the button and Austin Scott raised to 150,000 from the big blind. Richey called. The flop came down and Scott bet 125,000. Richey raised all in for 745,000. Scott called and the crowd rose to their feet. Richey tabled the for trip deuces with an ace kicker. Scott held the for trip deuces with a king kicker. The turn was the and river the . 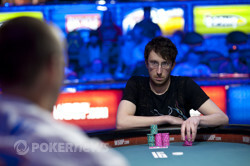 Richey's hand held up and he doubled to 1.79 million in chips. From the button, Austin Scott raised to 100,000 and Brett Richey reraised from the big blind to 300,000. Scott called. The flop came down and Richey moved all in for 295,000. Scott folded and Richey won the pot.